Gotta Love It 7 became the 2012-2013 NSW 18ft Skiff champion when Euan McNicol (replacing regular skipper Seve Jarvin), Scott Babbage and Peter Harris took out the last race of the championship on Sydney Harbour today. After trailing Pure Blonde (Tom Clout, Rob Bell, Matt Wark) by two boatlengths at the first windward mark, Gotta Love It 7 edged away to a 30s lead downwind, then from that point were never likely to lose. 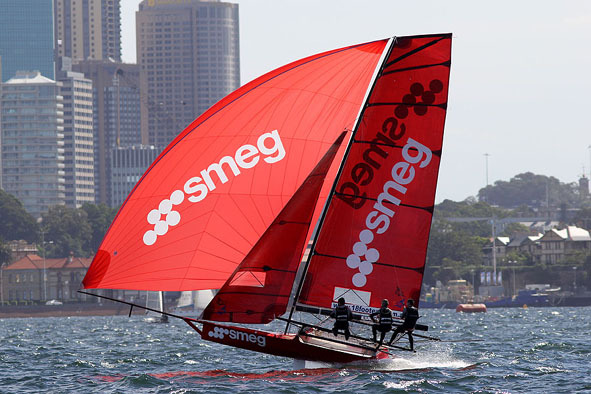 Smeg (Nick Press, Dan Phillips, Dave Ewings) stayed in touch with ‘7’ over the first two laps of the NE course but couldn’t match the Giltinan champions over the final lap to go down by 2m52s. Pure Blonde were consistent all day after their early lead and finished a further 46s back in third place. Jonathan Whitty’s Lumix was fourth, followed by De’Longhi-Rabbitohs (Andrew Cuddihy), Yandoo (John Winning), Coopers-Rag & Famish Hotel (Jack Macartney) and Mojo Wine (James Dorron). Final pointscores in the championship were: Gotta Love It 7 on 10 points, Smeg 11 points, Thurlow Fisher Lawyers 15, Yandoo 16, Pure Blonde 17 and Coopers-Rag & Famish Hotel on 23. The fleet was divided in rig choice with the NE breeze around 12-15-knots. Results proved that the smaller #2 rig was the correct choice. While Gotta Love It 7 had the edge over the rest of the fleet, there was plenty of close racing throughout the fleet. There was little between Smeg, Pure Blonde and Thurlow Fisher Lawyers for most of the journey while Lumix, De’Longhi-Rabbitohs and Yandoo were always in close contention.